As a dietary supplement, take one 250mg PrimaVie® Purified Shilajit capsule daily. 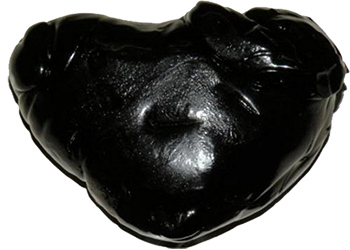 Shilajit is a tar-like substance composed of organic material and fulvic acids. It's color varies from white to yellow to brown (the most common) to solid black (the most potent). Once extracted and purified, it is mostly a brown-black substance. Shilajit is typically found in the Himalaya and Tibet Mountains and is usually collected during the summer months. It is sometimes described as "rock sweat" because the heat of the sun causes it to leak from cracks or crevices in the mountains. The word Shilajit, pronounced shil-ah-jeet, is derived from the Sanskrit word shilajatu which translates to "conqueror of mountains and destroyer of weakness." British archaeologists have discovered use of Shilajit dating as far back to 3,000 B.C. in the Indus Valley Civilization. Like Bacopa monnieri and Ashwagandha, Shilajit has been used in Ayurveda for its numerous reported benefits. In fact, it is believed to be the most powerful rasayana (an herbal formulation, in traditional Ayurveda. In Sanskrit, rasayana means "the science of lengthening lifespan." Because of this, PrimaVie® Shilajit is touted as a natural energy booster. PrimaVie® Shilajit has been shown to support healthy mitochondrial function. Moreover, PrimaVie® may improve CoEnzyme Q10 (CoQ10) benefits - another dietary supplement known for supporting mitochondrial function. Shilajit may also promote endurance during physical exercise and helps support overall fitness level (hence it being referred to as the "destroyer of weakness"). While there are many forms of Shilajit capsules or powder available for purchase online, PrimaVie is a high quality, purified Shilajit supplement from the Himalayas that contaiins dibenzo-α-pyrones (DBPs), DBP-Chromoproteins (DCP), Fulvic Acid and over 40 different minerals, with very low levels of heavy metals. Nootropics Depot also offers PrimaVie® Purified Shilajit Powder. Read PrimaVie Purified Shilajit reviews and experiences below. ATTENTION: These statements have not been evaluated by the Food and Drug Administration and this product is not intended to diagnose, treat, cure or prevent any disease. I take this with CoQsol-CF CoQ10. Primavie Shilajit works well. I feel mentally and physically better the mornings I take it. It's old but it's good! I was really intrigued by the descriptions of this strange stuff due to similarities to another strange stuff I ran across in some arcane 19th century accounts of "fossil fish oil" oozing from a formation on the Red River here in Texas. Early entrepreneurs began bottling it and gathered a great following of satisfied customers. Pressure was put on the itinerant purveyors to stop selling this but demand continued and I believe it is still available in small quantities. Reading about the descriptions of Shilajit is from the Himalayas, I began to think those ol' Texas boys might have been on to something legit. It took about 3 days before I noticed unmistakable effects. Forced to do some heavy brush and vine clearing just as the Texas temps hit the '90's early, I was able to stand several hours each day fighting the jungle back and get the job done. This was beyond my endurance prior to taking Shilajit; color me impressed! I just received some Polygala Tenuifolia to go with the Shilajit and it's having a wonderful synergistic effect. This is great stuff for those of you that have things to do in the great outdoors with summer coming on. Been on Shilajit for a few months now. Calmness and increased stamina is what I feel with 2 to 3 capsules daily. Actually sleep more deeply too. Good stuff. Just took a while for me to feel anything. Was taken aback by the effectiveness of this product. I didn't expect much from PrimaVie. I'd ordered a bottle of it just for the heck of it. With PrimaVie, I've observed the following benefits : increased self-confidence, assertiveness, better outlook, increased energy and clarity/sharpness of mind. I'm quite impressed by this product. I think the most interesting effect I found from taking these capsules is that my fingernails seem much stronger! I have always had weak and brittle nails, and I noticed after using a bottle of capsules, they were stronger. When I ran out I did not purchase more. Then my nails got weak again! So I purchased 2 more bottles and will continue taking. I know minerals are as important to our bodies as vitamins, and I guess the fingernails are a physical manifestation of what is going on at the cellular level. Great product. I like to take it in the morning with epicor for immune support, and it works great. I never get sick anymore. Don't really notice any nootropic benefits, however, but it has great energy, esp. when paired with cordyceps. I had read about this product and decided to try. I have been taking it for a month and feel more energy in general. My bf is taking it too.